Geraldinho is a retooled version of Teddy Boy, produced by Tec Toy and released exclusively in Brazil. The main character was replaced by "Geraldinho", a popular comics character created by Glauco Villas Boas, a famous brazillian illustrator and cartoonist, for children's section of the newspaper "Folha de São Paulo" called "Folhinha". This game was another attempt of Tec Toy to suit the brazilian children audience, using characters from popular comics, series and magazines and, even though people generally don't have the game in their top lists, everyone in Brazil who lived in the 90's remembers of it with much affection. VLUPT!!! It took only one kick from his friend Cachorrão for him to get inside his own game! 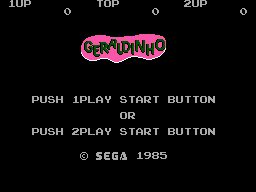 Cachorrão, this way, took control of the joystick and is now having fun at the expense of Geraldinho. This, in turn, has a rays pistol to beat the monsters which chase him in the game. And people say that the dog is man's best friend..
You play as a little boy named Geraldinho who can jump ( ) and use a pistol of special rays to shoot ( ) enemies that come out of dice-looking boxes, turning them into items that when collected grant points. There are also barricades which can be destroyed by shooting them a few times, as well as the boxes with numbers that go down as they get shot, indicating how many hits are needed until they break. Killing all the enemies and breaking all the boxes within the time limit, and without losing all your five lives, makes you advance to the next level. Reaching 100.000 points grants you an extra life and 400.000 points grants you another one. When the levels 2, 6, 10 and 14 are completed you are sent to Bonus Levels on which you can get a lot of extra points!